Alex Gacek shuffled between three ECHL teams in 2016-17, but he finished seventh in rookie goals and ninth in points by a first-year player in that league. Gacek, a 2016 Miami graduate, scored 26 times and dished for 26 assists en route to a 52-point rookie campaign with South Carolina, Orlando and finally Atlanta. Gacek started the season with South Carolina but was traded to Orlando on Dec. 29. On March 7 he was acquired by Atlanta at the trade deadline. Gacek ended the season with a plus-11 rating and his shooting percentage was 18.7. OTHER ROOKIES: Matthew Caito played just 23 games with Toledo during the regular season, but the defenseman scored eight times and added six assists. Caito picked up his first pro hat trick vs. Fort Wayne on Nov. 25 as part of a five-game stretch in which he found the net seven times. Caito also played with Grand Rapids (AHL) for 13 games before returning to Toledo for the playoffs, racking up nine more points in 17 games. He logged eight games with the Walleye at the end of 2015-16 following Miami’s season. Taylor Richart (photo by Cathy Lachmann). Defenseman Taylor Richart netted seven goals and picked up 13 assists in his first pro season. Playing for Utah, Richart was limited to 48 games in 2016-17 but still finished second on the team in blueliner goals. He was tops among ex-Miamians in ECHL defenseman points with 20. Defenseman Colin Sullivan made his pro debut with Atlanta this spring after wrapping up his season season in Oxford. Sullivan earned his first career assist at Greenville on April 2. 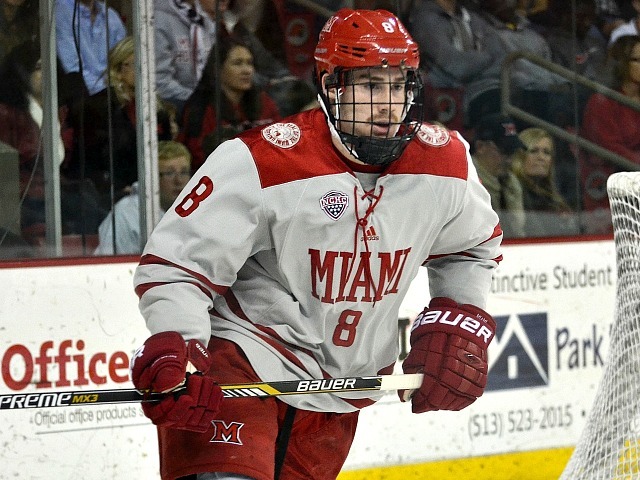 LEADING AT INDY: Alex Wideman led all former RedHawks in ECHL points last season with 55. Alex Wideman (photo by Cathy Lachmann/BoB). He was tops on Indiana in assists (33) and shootout goals (3) and has already racked up 94 points in 128 games in the league. Wideman played juniors in Indianapolis for two years prior to his Miami career, and now calls his former rink home. MINORS MASTERTON: Alden Hirschfeld required season-ending brain surgery in 2015-16 but returned to post a career-high 49 points last season for Toledo. Hirschfeld also set high marks in goals (23) and plus-minus (17). After earning a promotion to AHL Grand Rapids, Hirschfeld collapsed on the bench as the result of a seizure on Jan. 8, 2016 and underwent a craniotomy on March 14, during which a malformation on his brain was removed. MILESTONES: Gary Steffes needed two points to reach the 200 mark for his career entering the final game of the 2016-17 regular season. His line in that contest: 1 goal, 1 assist, capped off by a clinching marker in a 4-2 win over Wichita. Steffes also scored his 100th ECHL goal late last season and has rolled up 105 in four seasons in that league. PLAYOFFS?! PLAYOFFS?!?! No former Miamian advanced to the championship series, but Kevin Morris and Matthew Caito both posted nine points as their respective teams qualified for the conference final. Morris played 19 games with Manchester, scoring five goals and adding four assists, and defenseman Matthew Caito racked up a goal and eight helpers. Dynasty team Allen was bounced in the second round, and Gary Steffes finished with three goals and three assists in that team’s postseason. See also: BoB’s look at RedHawks in the NHL, as well as RedHawks in the AHL in 2016-17. On deck: BoB takes a look at Miamians in other leagues. OXFORD, Ohio – Somehow Miami managed to score twice on special teams despite having just 1:33 of power play time vs. 13:49 for Colorado College. Miami’s Jay Williams (right) and Taylor Richart (left) both starred in Friday’s win (photo by Cathy Lachmann). Those goals propelled the RedHawks to a 3-0 win over the Tigers on Friday, their second shutout of the season and the first of 2015-16 for senior Jay Williams. A defining moment for Miami (14-14-3) came midway through the third period, when junior forward Anthony Louis was assessed an interference major and game misconduct. Teemu Kivihalme was also given a minor on the ensuing skirmish, setting up a 4-on-4. But senior defenseman Chris Joyaux went to the box for slashing 49 seconds later, setting up a 4-on-3 for 1:11 followed by a 5-on-3 for 49 seconds. Nine of Colorado College’s shots came during this sequence, and Williams stopped them all. MU was 7-for-7 on the PK and is second in Division I at 92.9 percent. It was the second interference major of the game for Miami, as sophomore defenseman Scott Dornbrock was also sent off for that infraction in the second period. RedHawks senior defenseman Scott Richart buried a shorthanded goal during that extended penalty kill. By the way, Miami had taken one major penalty all season entering this game. Not a fan of criticizing officiating, but it was brutal in this game. For the power plays to be 7-2 favoring a less-skilled team including a pair of majors is lunacy for a Miami team that does not have a reputation for dirty play. 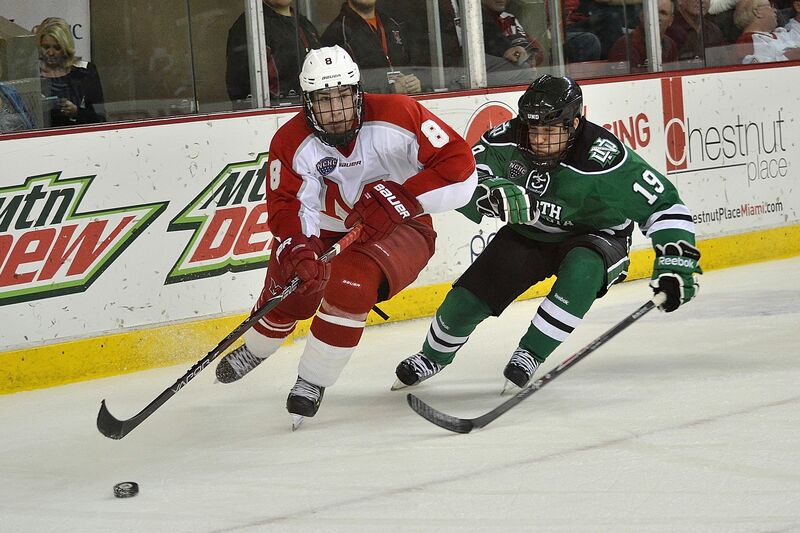 The RedHawks came into this weekend averaging 8.0 penalty minutes a game, in the bottom 10 in all of Division I. They should’ve just called the Dornbrock penalty what it really was: A Hitting Too Hard Major. Maybe it was interference. Maybe. As in: A minor penalty. But as someone who thinks interference should be called more in hockey, it’s something I watch for, and there were several better examples of that infraction both ways that could’ve been called prior to Dornbrock’s major. Didn’t see Louis’ hit – it was along the boards. But when a player stays down for a minute and none of his teammates come to his rescue and the trainer watches him lay motionless it’s pretty safe to say he’s pandering for a call. Which he got. Physicality isn’t a big part of Louis’ game, and the player he hit was twice his size. For the record the interference major was introduced prior to 2014-15 as an option for officials if someone gets laid out away from the play, so from a rules standpoint it’s a valid call. These specific examples didn’t rise to that definition though. We’re talking borderline minors, and the first one didn’t really even look like that. In the third period it looked like the refs were going to swallow their whistles, as they led several would-be penalties against both teams go. Then Conor Leminande, interference, 8:46? Yeah, OK. Right after that expired the Louis debacle which could’ve been a game changer, and in a way it was, just not in favor of the team with the man advantage(s). 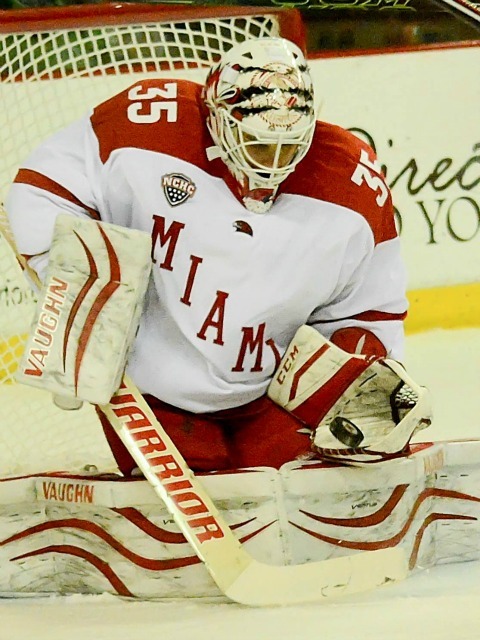 Miami goalie Jay Williams (photo by Cathy Lachmann). And that’s the bottom line: Miami turned a negative – miserable officiating – and made it a positive. Taylor Richart shorthanded goal, Jay Williams about 90 saves in the third period. Miami did what a good team should do: Win even when things out of its control go against it. – All of the above said, the RedHawks really didn’t play that well. Colorado College (6-24-1) only has one decent scorer – Hunter Fejes – and Miami did a good job of containing him. The Columbus line was very good but none of the others could get much going. The Tigers are allowing 35 shots per game and Miami finished with 26. Granted it doesn’t help when you’re shorthanded for a quarter of the game. 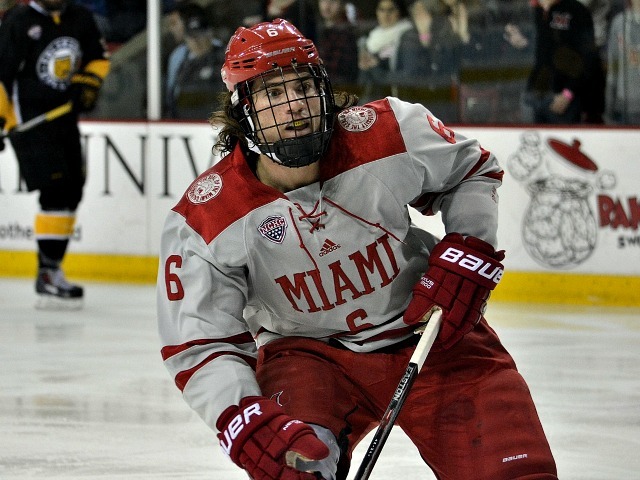 Miami defenseman Matthew Caito (photo by Cathy Lachmann). – Senior Matthew Caito was out of the lineup for the second time in his college career. He suffered an upper body injury last Saturday but looked fine when he was walking around before the game. Caito has played in 159 games and is nine away from cracking the top 10 on Miami’s career leaderboard. 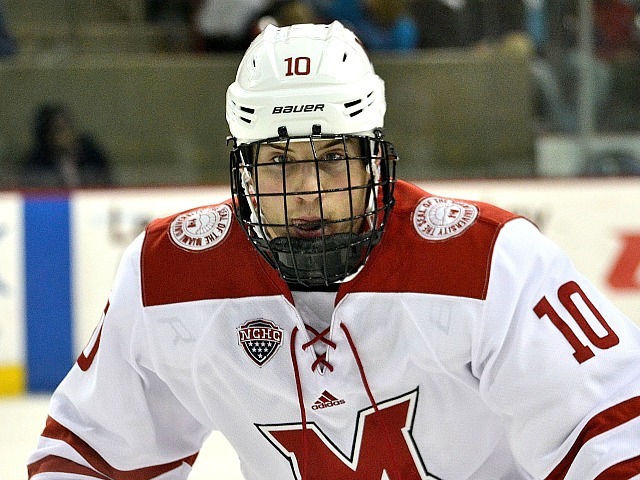 The RedHawks absolutely need him in the lineup for the NCHC Tournament. – Coach Enrico Blasi almost took a tumble during the Louis skirmish, as he was leaning forward when the action came over the bench, knocking him back. Fortunately he caught himself before taking a potentially nasty spill. – The UNO loss was nice on Friday but Minnesota-Duluth really needs to lose to St. Cloud State on Saturday. If UMD wins Miami would have to sweep in Duluth to earn home ice. – Saturday’s game will be on DirecTV Ch. 608 in retina-burning standard def. FORWARDS: C-. First line was solid, after that, comme ci comme ca. As mentioned, Colorado College is allowing 35 shots a game, and this corps just didn’t generate the type of chances it should have against the league doormat. Louis looked a step behind before being sent to the showers early. Kiefer Sherwood seemed to have picked up that speed Louis didn’t have, as the puck seemed to follow him all night. He’s proving absolutely deadly from the left side of the slot, where he buried his power play goal. DEFENSEMEN: B-. This group seemed a little out of sorts without Caito in the lineup, as the pairings obviously had to be adjusted. Richart was outstanding, thriving in his PK role. Chris Joyaux had an outstanding first period but turned one over in the third for a breakaway and took a penalty trying to defend the player that stripped him. Louie Belpedio didn’t have a great game and may be suffering from the effects of playing in Europe over Christmas break. Colin Sullivan had one bad turnover but was solid otherwise. GOALTENDING: A+. The easiest grade to give all season. Williams was simply unbelievable, especially under intense fire in the third period. The goalie’s best friends – the posts – helped him out a couple of times, and the net mysteriously came off its moorings multiple times to squelch scoring threats. Still not sure how he stopped a one-time shot from point-blank range in the final stanza, and Colorado College kept the puck alive and missed the empty net. Great game plus a little luck equals shutout. 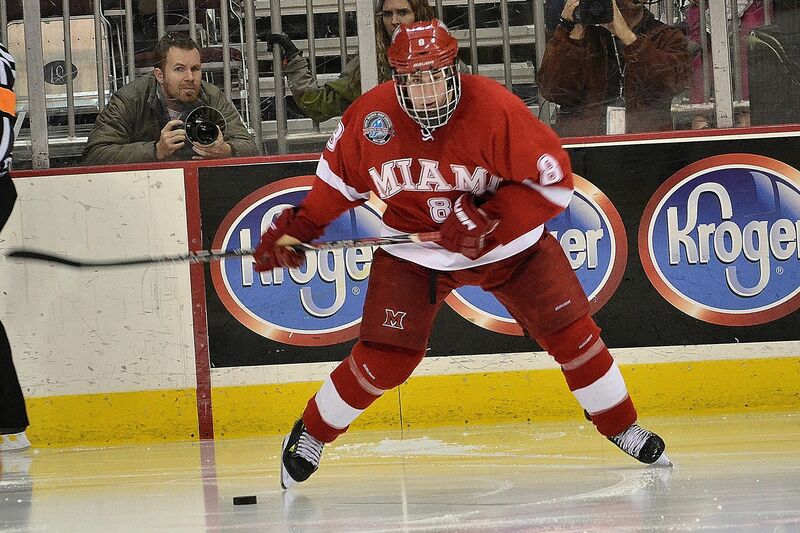 Miami’s Michael Mooney (photo by Cathy Lachmann). LINEUP CHANGES: So Blasi shook things up a little up front. Michael Mooney played for the first time in 11 games, and Ryan Siroky also saw action after being scratched for three straight. Andrew Schmit sat for just the fifth time this season, and Devin Loe was also out after playing in four in a row. Sullivan was in for Caito on defense. Goalie Ryan McKay was not dressed for 11th straight contest. OXFORD, Ohio – While Taylor Richart’s presence in Miami’s lineup seems like a given on a nightly basis, there was a point when he pondered whether he had a shot at making it to this level. 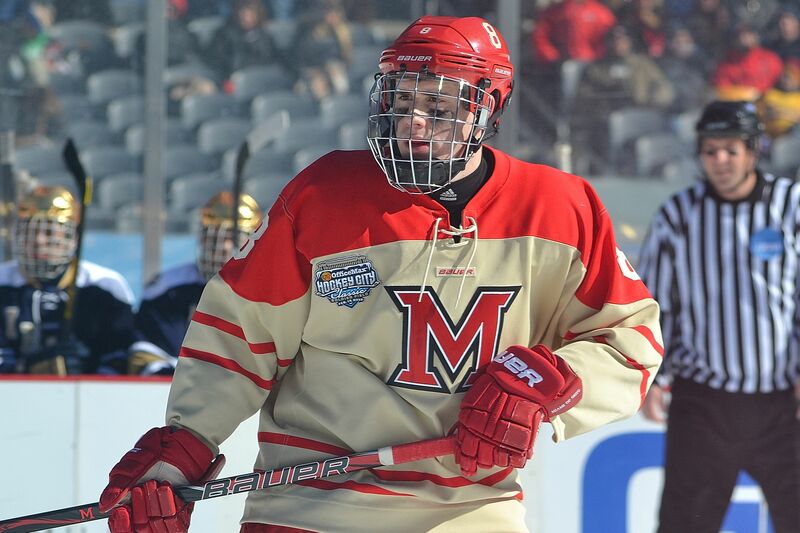 Undersized for a defenseman at 5-feet-9, the senior went from having to try out to make an NAHL team to logging 122 games at the Division I level for the RedHawks and becoming one of their most dependable and toughest stay-at-home blueliners. Taylor Richart as a freshman (photo by Cathy Lachmann). Richart was born and still lives in Blaine, Minn., a northern suburb of Minneapolis, and was a rink rat practically from birth. His father, Scott, played for the University of Minnesota and still coaches youngsters. Richart learned how to skate at a small park a couple of minutes from their home as a toddler and was a natural on the ice. Prep hockey is huge in Minnesota, and Richart helped Blaine High School qualify for the state tournament twice, including a third-place finish in 2009. He was named to the all-conference team in 2010. Richart at the outdoor game in Chicago in 2013 (photo by Cathy Lachmann). But at that point, he didn’t see a lucrative future for himself in the sport and considered non-scholarship competition. Richart also patrolled second base and shortstop growing up, and he thought he could play hockey in the winter and baseball in spring if he went to a Division III school. After his senior year of high school, Richart received a call from an acquaintance that offered him a tryout for NAHL Aberdeen. Richart not only earned his way onto that team, he logged 53 games, scoring twice and dishing out 10 assists. He worked as hard as anyone on the ice, impressing so much that he joined a USHL team the following season and went 7-9-16 for Fargo. Richart was preparing for a third season in juniors when a late defection left Miami short a defenseman. He came to Oxford for a visit and fell in love with the campus. Richart as a sophomore (photo by Cathy Lachmann). Richart proved himself ready for that challenge right away as well. Two years after trying out to make an NAHL team, Richart was in the lineup for an elite Division I school. He played 40 of 42 games as a freshman, went plus-2 with four assists and was fourth on the team with 49 blocked shots. A concussion essentially ended Richart’s season after 24 games as a sophomore. Despite the short year, he managed five assists and still blocked 36 shots while taking just one minor penalty. With more freshmen coming in for his junior season, Richart again had to work his way into the lineup. After being scratched for the first five contests of 2014-15, he hit the ice for the final 35. Richart netted his only career goal that season in a 3-0 win over Cornell on Dec. 29, 2014. He piled up 45 more blocks, finished plus-5 and took just three minors. 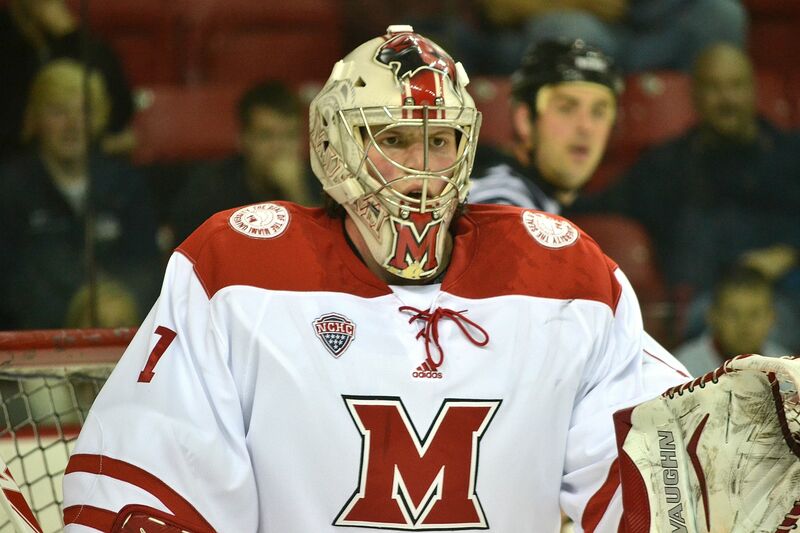 In 23 games this season, Richart leads team with 46 blocked shots – 11 ahead of any other RedHawk. – and he has three assists. “The last couple years he’s done a tremendous job, really working hard to bring everything else along,” Williams said. Richart as a junior (photo by Cathy Lachmann). He also won the team’s hardest shot competition prior to this season. He also has just four penalty minutes, giving him 12 PIM in 90 games since the start of his sophomore season, a marvel considering his stay-at-home role. Richart has a goal and 16 assists for his career, but points are a deceiving stat for a player in his role, and his total does not reflect the obvious improvement in his game since he first set foot on the ice at Cady Arena in 2012. Having a father who played at the college level and still coaches has helped Richart become a smarter player as well. “He knows the game very well, and as a smaller guy you have to know the game a little better,” Blasi said. Richart uses the hockey smarts he father instilled in him to overcome the size deficit he faces when he dresses for games against ultra-physical NCHC opponents. Richart grimaces after blocking a shot (photo by Cathy Lachmann). “You’re not going to out-muscle guys – you’ve just got to be smart,” Richart said. “Know the game, know your strengths and weaknesses. Just make strong plays. I know I’m not going to be the bigger guy, and that’s part of the reason why I kind of got overlooked, because I’m smaller, but I always knew I was going to have to out-think someone rather than rough them up. If there was a statistic for penalty minutes drawn vs. penalty minutes taken, Richart would have to be high on the Division I leaderboard. He has drawn boarding majors numerous times in his career and has rarely missed a shift despite taking some brutal-looking hits. Besides the concussion, Richart said he has broken fingers a couple of times, fractured a foot on multiple occasions and has received countless stitches. He also bruised a lung earlier this season and required medical treatment as he was coughing up blood. Richard missed just two games for the latter, the only times he has not been in the lineup in 2015-16. “A couple of times I’ve gotten stitches this year and last year and just put some glue on it and repair after the period so I don’t miss time,” Richart said. Richart as a senior (photo by Cathy Lachmann). Whenever Richart has to visit a doctor, the paperwork heads north to his parents. Caito is one of Richart’s best friends, and he said that Richart has earned the nickname The Deputy because of his militaristic routine. Richart has a 3.3 grade-point average as a sports leadership management major and will graduate this spring. He want to continue playing hockey in the professional ranks beyond this season but is currently focused on his final collegiate games as he wraps up his last few months in Oxford. OXFORD, Ohio – A successful career in college athletics has always been in Matthew Caito’s pedigree. 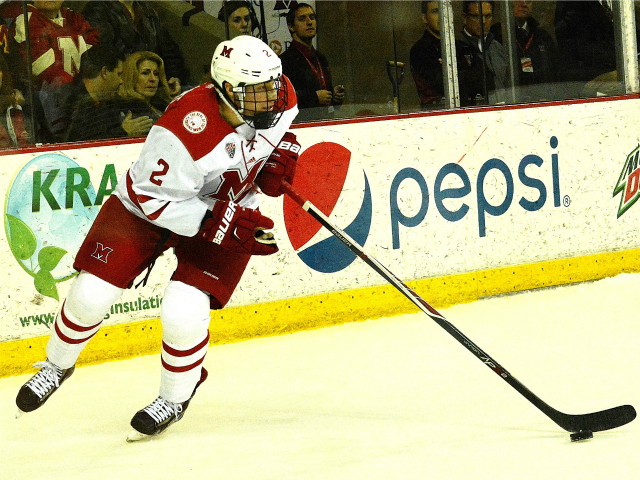 Several members of the senior defenseman’s family have competed for Division I schools. But not in hockey, a seemingly unlikely sport of choice for a 22-year-old raised in Southern California. His parents, both college athletes originally from New England, encouraged the 5-feet-11, 187-pound Caito to choose hockey, and it was a natural fit. Caito’s father and grandfather both played football for Boston University, and he had uncles that suited up for the Boston College and University of Pittsburgh football teams. 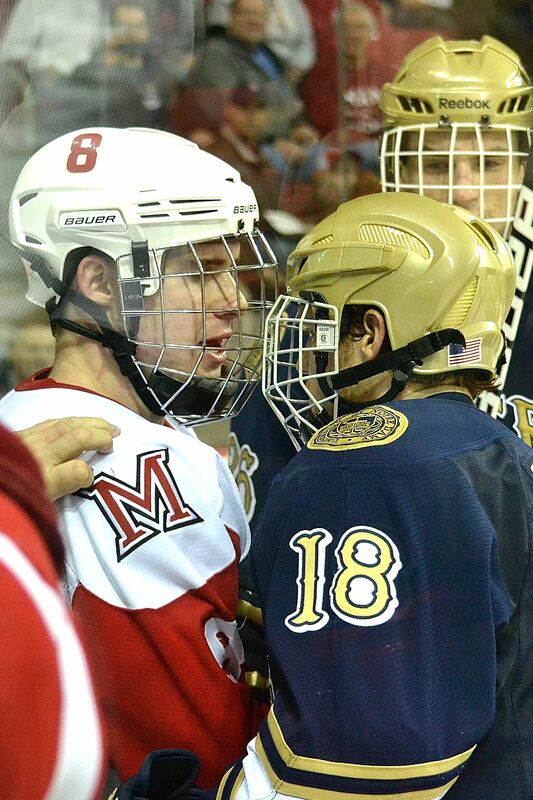 Matthew Caito confronting a Notre Dame player as a freshman (photo by Cathy Lachmann). His aunts played field hockey, and his mother was a collegiate gymnast. The increasingly-violent nature of football is why Caito was steered away from the gridiron. However, rinks are rare in the San Diego suburb of Coto de Caza, where he hails from. With limited local practice facilities, Caito spent of lot of time traveling in search of ice. 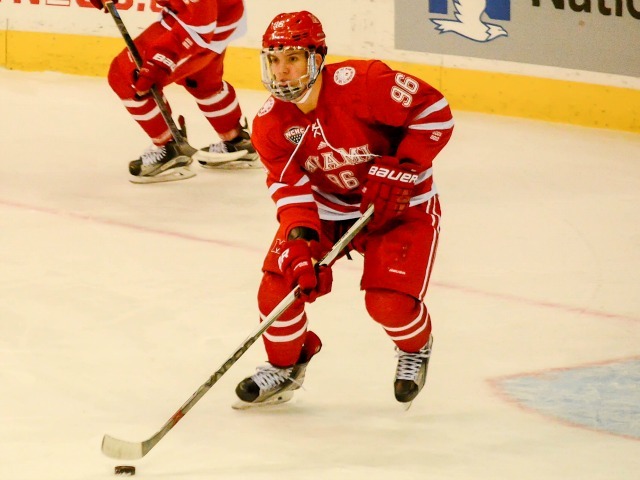 Caito’s hockey talent was obvious, so during his high school years he was sent across the country to the Salisbury prep school in Connecticut, where he joined current teammate Kevin Morris. 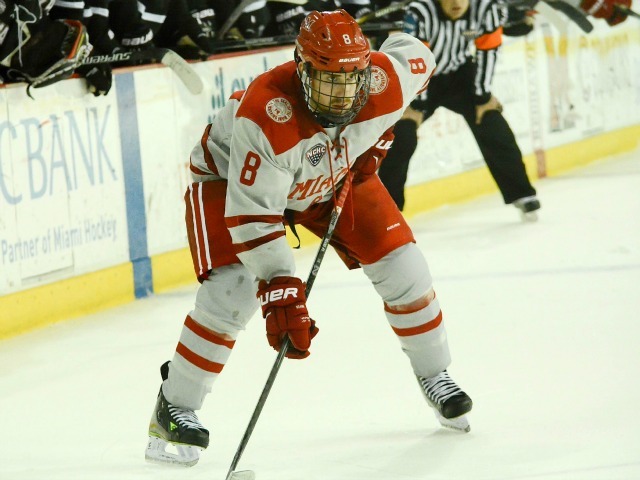 Following two years in prep school, Caito spent one season in juniors, playing for Dubuque, where he was second in defenseman points (26) and first among blueliners in assists (19). He finished that campaign with the second-best plus-minus on the team at plus-16. Matthew Caito as a freshman (photo by Cathy Lachmann). 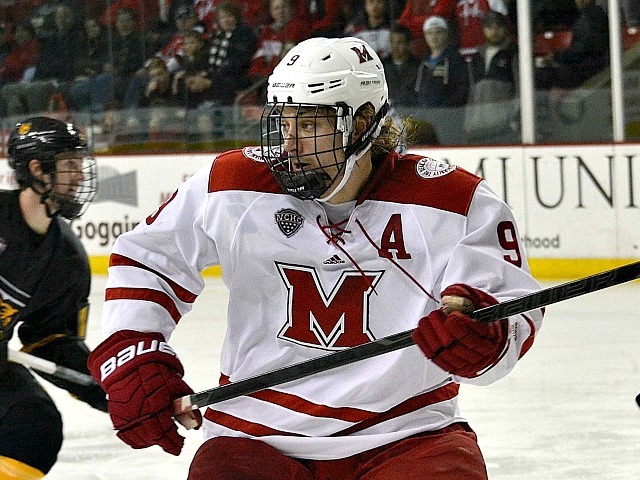 During his prep school years, Caito participated an evaluation camp in Oxford with former RedHawk Riley Barber while current MU assistant coach Brent Brekke was in attendance, setting the stage for Caito’s Miami career. Caito fell in love with the campus as soon as he saw it. Knowing that friends and classmates Jay Williams and Alex Gacek, who were also in east-coast prep schools, were both committed to Miami helped seal his decision. “I’m like, if there’s more kids like these that are coming in with my class these are going to be a great four years, and it’s been that way,” Caito said. 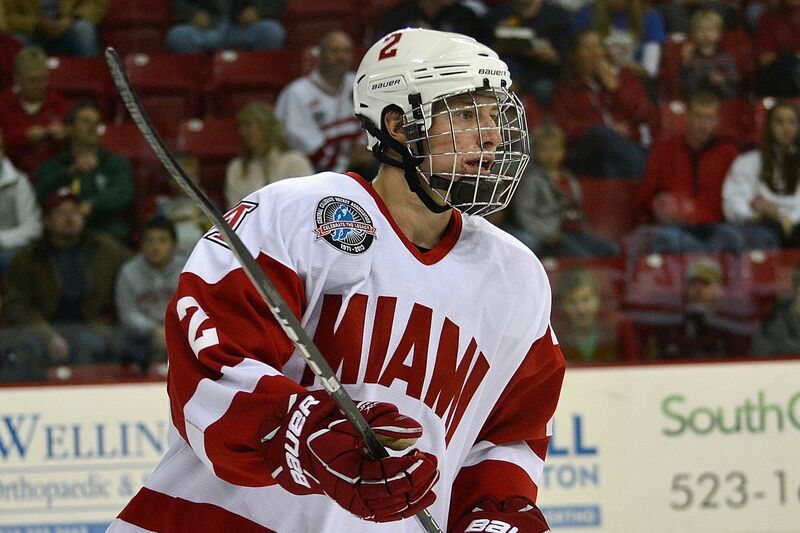 A goal of Caito’s was to come to Oxford as a true freshman, and after just one season in the USHL, he dressed for Miami on opening night in October of 2012. 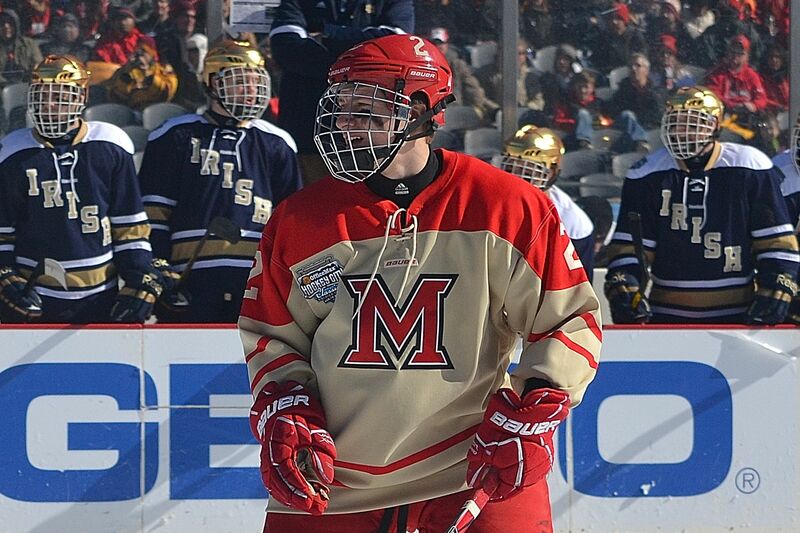 Matthew Caito at the outdoor game at Soldier Field in 2013 (photo by Cathy Lachmann). All he did his rookie season was lead the RedHawks in defensemen goals, assists and points (5-6-21). He was the lone freshman to play every game in 2012-13, led Miami with 81 blocked shots and he tied for third with a plus-12 rating on a team that advanced to the NCAA regional final in Toledo. Matthew Caito as a sophomore (photo by Cathy Lachmann). Sophomore season was a disappointing one for the RedHawks overall, the lone campaign in the last 10 years they did not qualify for the NCAA Tournament, but Caito led the team in blocks again with 73. Matthew Caito as a junior (photo by Cathy Lachmann). He also topped the defense corps in assists (13) and points (16), finishing with more helpers than the second- and third-best D-men combined in that category. It was another solid season for Caito as a junior, as he went 4-20-24 – again posting Miami defensemen highs in the latter two – and he led the team with a plus-19 rating and in blocked shots with 64. That includes a goal and an assist in the RedHawks’ NCAA Tournament loss to Providence. This season, Caito has three goals and six assists for nine points and 32 blocks. All of his goals have come on the power play, and he netted the game winner at Nebraska-Omaha on Jan. 22 in a 3-1 win over the seventh-ranked Mavericks. That’s a total of 250 blocked shots. In 3½ seasons, Caito has recorded 15 goals and 55 assists for 70 points. He currently ranks ninth in school history in defenseman assists and points and is tied for eighth in markers. Matthew Caito and Taylor Richart celebrate after winning the NCHC championship in 2015 (photo by Cathy Lachmann). In the Cady Arena era, Alec Martinez is the only defenseman with more goals than Caito, and Martinez has won a pair of Stanley Cups with the Los Angeles Kings. And then there’s Caito’s durablility. He has missed one game in his career at Miami, and that was the opener in 2014-15. He has played in 142 games and is just 16 shy of cracking the top 10 in team history. For that to happen, the RedHawks need to play three postseason games, and they are guaranteed two in the best-of-3 first-round series under the NCHC format. Curtis McKenzie and Joe Hartman are currently tied for ninth all-time with 158 games played. The statistics don’t always do responsible defensemen justice, but Caito has improved in his play across the board, from clearing pucks on the penalty kill to becoming more physical and knocking forwards entering the offensive zone around. Richart is one of his best friends on the team, and the two have been friends since coming to Oxford. The duo is nicknamed the Rock Brothers because they are so close, and both are similarly solid on defense. Richart has seen Caito’s improvement first hand over the past four years. Matthew Caito as a senior (photo by Cathy Lachmann). And Caito has made Williams’ life much easier in front of him with his tough defensive play. Caito is set to graduate this spring with a 3.0 grade-point average in sports management with a minor in economics. His professional future appears bright. Any AHL team would be lucky to have a two-way defenseman with Caito’s talent. But for the next couple of months, Caito is focused on completing his degree and his senior season, and he reflected on his time at Miami. Miami’s power play could not have picked a better time to break out of its funk. Matthew Caito (photo by Cathy Lachmann). Senior defenseman Matthew Caito ripped home the decisive goal late in the third period as the RedHawks took down No. 7 Nebraska-Omaha, 3-1 at Baxter Arena on Friday. 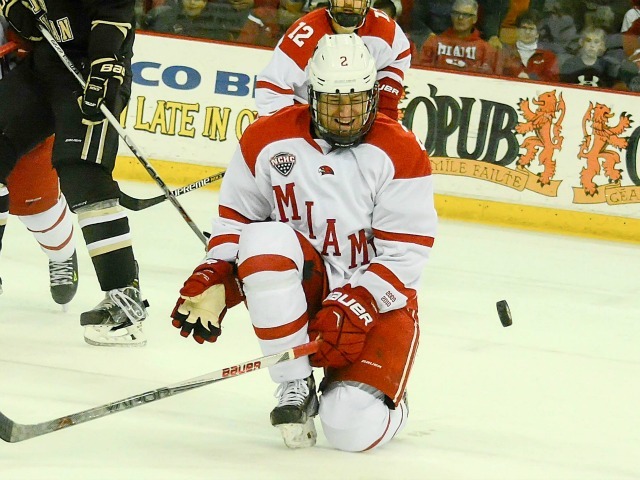 The win snapped a seven-game road losing streak for Miami and vaulted the RedHawks into a tie for 23rd in the PairWise rankings, which determine qualifying for the NCAA Tournament. There was no flow in a first period that ended scoreless. Early in the second period, Miami freshman forward Zach LaValle appeared to open the scoring with a behind-the-back backhand that slid into the net. It was ruled a goal on the ice but was reversed by the officials, claiming LaValle interfered with the goaltender. But the RedHawks (8-11-3) kept the pressure on, and classmate and fellow forward Kiefer Sherwood bounced off a defender, seized the puck and whipped a wrister home from the slot after skating in from along the boards with 6:13 left in the middle frame. The Mavericks (15-7-1) tied it 3:32 into the third period when a wide-open Austin Ortega ripped a one-timer into the net off a pass through the crease. Miami junior forward Anthony Louis won a battle along the boards with a strong stick, skated to the side of the net and threaded a pass through the slot to the top of the opposite faceoff circle, where Caito blasted the go-ahead goal into the top of the net with 2:03 left. Senior forward Kevin Morris added an empty netter with 27 seconds remaining to cap the scoring. Caito finished with a goal and an assists, and senior goalie Jay Williams stopped 27 shots, including a grade-A chance on a one-timer from point-blank range, to earn his third straight win and the RedHawks’ second overall as well. Louis now has four points in his last three games (1-3-4), and freshman Josh Melnick also has a three-game point streak, picking up a helper in each. MU entered this game 1-for-20 in its last eight games on the man advantage. 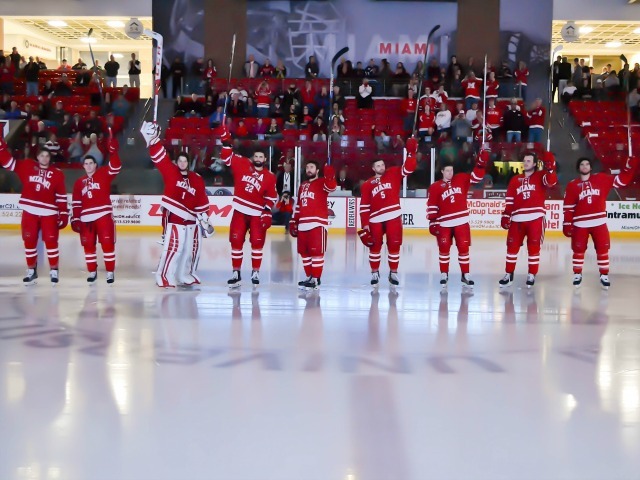 The RedHawks moved to within a point of Western Michigan for sixth place in the NCHC standings and are three back of the Mavericks, meaning Miami could catch UNO with a win in Game 2 of the road set. The teams wrap up the series in Omaha at 8:07 p.m. on Saturday. OXFORD, Ohio – A 2-1-1 record to start the season with one point from Anthony Louis and Sean Kuraly you say? As Miami fans, yeah, we’ll take it. The RedHawks’ two top returning scorers are off to slow starts offensively, but the RedHawks (2-1-1) swept Ohio State this weekend, 3-2 in Columbus and 3-1 in Oxford the following night with five of its goals coming by freshmen. Rookies have potted seven of 11 Miami goals for the season. Four of the five freshmen forwards have found the net in the team’s first four games. Miami’s Jack Roslovic (photo by Cathy Lachmann). Beyond Jack Roslovic, it was unclear entering the season how much newbies would contribute offensively to a forward corps that had lost Austin Czarnik, Riley Barber and Blake Coleman among others. But at least for two weekends, the answer is significantly. Overall, Miami hasn’t set the world on fire from a scoring perspective, averaging 2.75 goals per game. But the RedHawks missed several Grade A scoring chances in the first period alone on Friday and had multiple chances on Saturday it should’ve cashed in. MU finished the finale with 41 shots on goal and missed the net a number of times. There is cause for optimism regarding this team’s offensive potential. The RedHawks are holding their own during what most knew would be a transition process with numerous new faces taking over the jobs of established studs. If they have been able to hold their own during their growing pains without contributions from Kuraly or Louis, just wait until those two hit their strides. And they will hit their strides, hopefully very soon. – This was the best all-around game Roslovic has played. He engaged in battles along the boards and was generally more of a presence on the ice than in the previous games. Roslovic also showed more of ability to make defenders look silly as he can seemingly skate around them at will, a feat made even more amazing considering he is still just 18. That won’t fly at higher levels, or even against better college opponents, but he is certainly showing everyone why he was a first-round pick this summer. – Sherwood seems to get better every game. He blew up in the USHL last season, scoring 29 goals after netting 13 the previous season, so hopefully that will translate at this level – it certainly did on Friday when he picked the top corner on his first college goal. And it looks like he could do more, as he engages physically and appears capable of playing both ways. Josh Melnick and Roslovic have been the obvious standouts early, but Sherwood looks like he may develop into a very good player for Miami as well. – The power play was 1,000 percent better on Saturday than Friday. Yes, Miami went 2-for-5, but beyond that, the puck movement was outstanding and the communication appeared much improved. The first unit could be devastating to opponents this season with Roslovic-Melnick-Louis-Kuraly-Belpedio, and its makeshift second unit scored the final goal on Saturday, with Zach LaValle finding the net. – Miami’s four-game road stand will be difficult but should provide a bonding opportunity and could make the team better overall. At least the RedHawks get their feet wet on a real road trip – not like Ohio State, which was an up-and-back drive with more Miami fans than OSU fans in attendance – before opening conference play in two weeks. FORWARDS: B+. At this point of the season, improvement is more vital than results, and the improvement is there. The freshmen are getting better. Louis played well but only had a point, and many more will follow. Kuraly has struggled at times early but appears ready to break out. If either Kevin Morris or Alex Gacek ever find the net they may be unstoppable – both have done everything right except finish in the first four games. Overall, this unit fired a ton of shots and missed the net a bunch more. They played pretty well defensively as well, but the competition will get a lot stiffer very soon. DEFENSEMEN: A. This unit made mistakes the first three games, and many were costly. That really didn’t happen on Saturday. We mentioned Louis and Kuraly and how they will get going eventually, and Louie Belpedio belongs on that list as well. His best hockey is yet to come. Senior Matthew Caito was outstanding, as he shut down seemingly every OSU threat on his watch, and classmate Chris Joyaux is playing some of the best defense of his career right now. Like with the forwards, the process is in place, which is very encouraging, and the opponents will get better from this point forward. 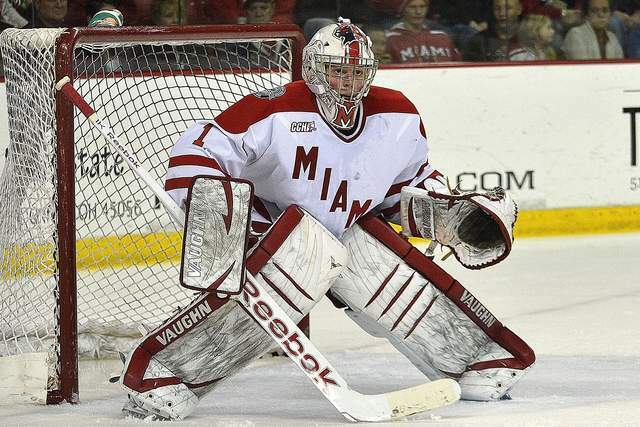 Miami goalie Ryan McKay (photo by Cathy Lachmann). GOALTENDING: A. Senior Ryan McKay hasn’t played a lot of back-to-back nights, but he shined in this one. He appeared to be screened on the only goal against, and he had to shut down a couple of high-percentage chances, including a breakaway. McKay finished 27 of 28 (.964) on the night and 52-for-55 (.945) on the weekend. This team’s prospects are a lot higher if McKay can continue to play at this level. LINEUP CHANGES: Senior Michael Mooney was back in at forward on Saturday, replacing junior Devin Loe, who did not have a point in his first three games. On defense, sophomore Scott Dornbrock was scratched for the second time this season, as junior Colin Sullivan returned to the lineup sheet. McKay started for the third straight game. 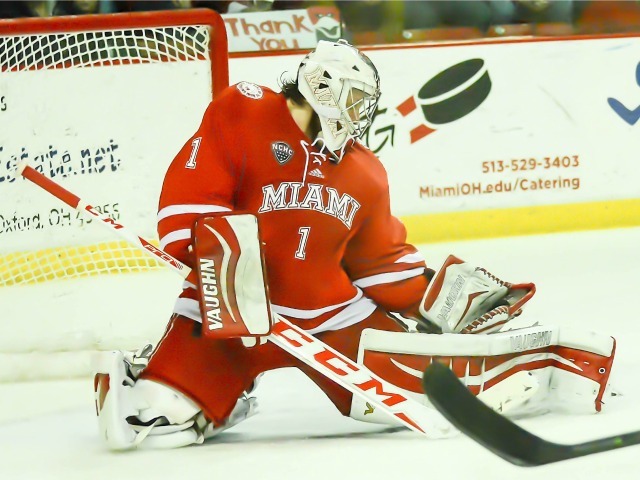 Miami lost 10 players from its NCHC Tournament championship team in 2014-15, including its top three points producers, but six regulars on defense plus both goalies return this fall as the RedHawks chase their 10th NCAA Tournament berth in 11 years. 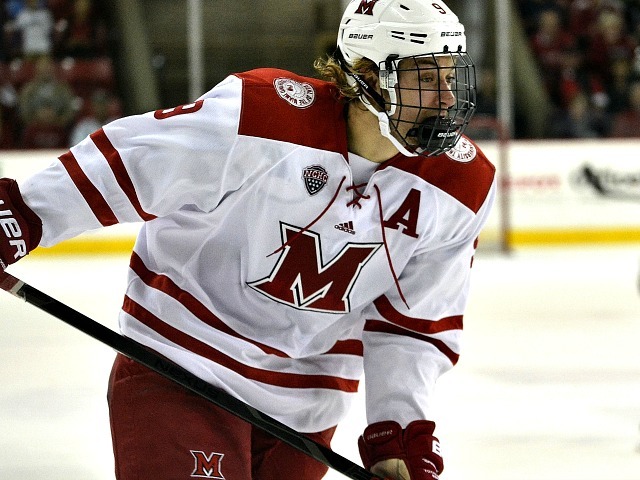 So with the loss of Austin Czarnik, Blake Coleman and Riley Barber plus others up front, Miami will need more offensive production out of its returning forwards and its newbies. The RedHawks entering the NCAA Tournament as the top seed in the Northeast Region last season but lost in the opening round, 7-5 to Providence. Miami hosts the Friars this weekend to open 2015-16. 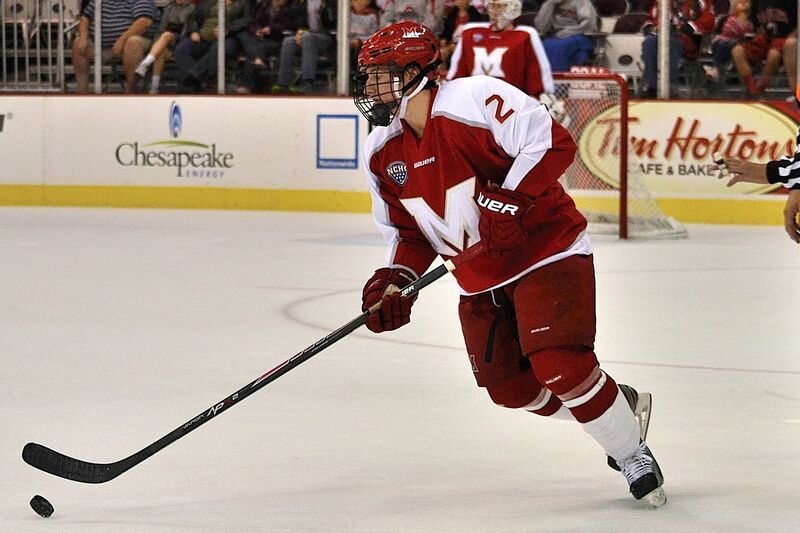 The Blog of Brotherhood takes a look at this season’s RedHawks by position. Czarnik, Barber and Coleman netted 49 of the team’s 130 goals and finished with 45, 40 and 37 points, respectively, and are all in the pros this fall. Senior Sean Kuraly is the returning leading goal scorer with 19 goals and 10 assists last season. He was also named team captain this off-season, taking over the reins from Czarnik, who had held that post for two years. Kuraly is the first son a former player, as his father, Rick Kuraly, is the team’s all-time leading scorer with 101 career goals. Sean Kuraly has 37 in three seasons and needs 65 to top his dad. “I’m going for 70,” Sean Kuraly said. Junior Anthony Louis finished with 36 points last season, fourth on the team and tops among all RedHawks back this fall. His 27 assists were second on the team. After that, the dropoff is substantial, as seniors Alex Gacek and Kevin Morris both went 5-9-14 in 2014-15. However, Gacek played the best hockey of his RedHawks career the second half of last season and has become a strong defensive forward. Morris also plays good defense and scored all of his goals on the power play, finishing plus-6. 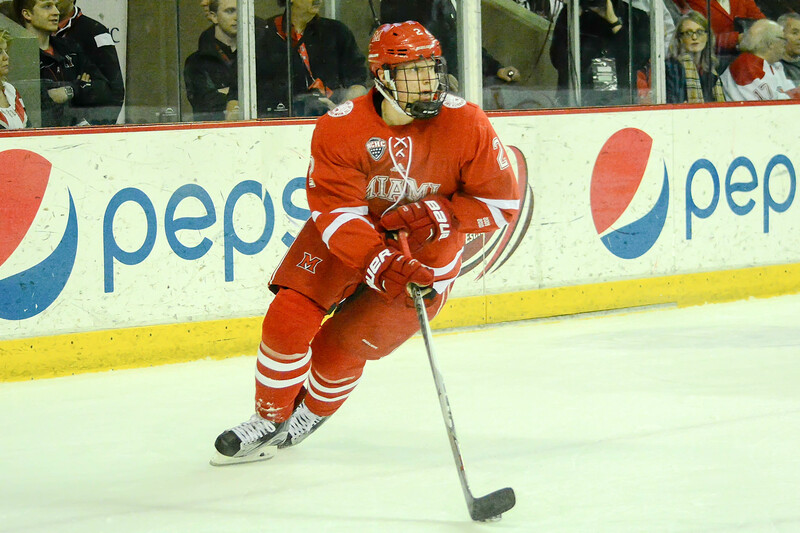 Junior Justin Greenberg, senior Andrew Schmit and sophomore Conor Lemirande also logged significant minutes last season, but Devin Loe and Michael Mooney – who combined to play 21 games – are the only other returning forwards that saw the ice last season. Jack Roslovic is the team’s top incoming forward. The former U.S. National Development standout, who played on that team’s top line last season, was drafted in the first round, 25th overall by Winnipeg in this summer’s NHL draft. He has two assists in the exhibition last weekend. Ryan Siroky, Zach LaValle, Josh Melnick and Kiefer Sherwood are the other freshmen forwards. Melnick found the net vs. Western Ontario on Saturday. With only nine returning forwards from last season and Roslovic a near lock to dress every night, the new forwards should have plenty of opportunity to his the ice. Miami only lost Ben Paulides from last season’s team on defense, returning six regulars. “That means we’re going a lot of faith in our defensemen to step up in big situations, and guys are progressing, so with the experience, (this group) should be very good,” senior Matthew Caito said. The top pairing of Caito and sophomore Louie Belpedio lead this group after ending last season plus-19 and plus-15, respectively. Caito had a career-best 24 points, including 20 assists, and will move into the top 10 all-time in Miami defensemen scoring this season. His 64 blocks led the team, and he has missed just one game in three years. 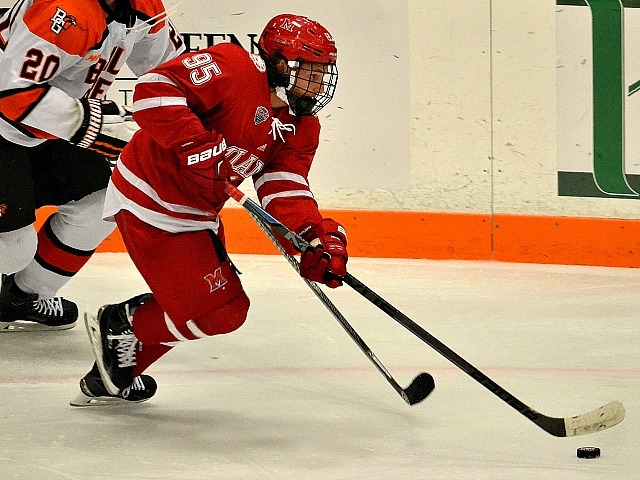 Belpedio, the Minnesota Wild’s third-round selection in 2014, posted a team blueliner-high six goals as a freshman, and also added 13 helpers. Senior Taylor Richart earned most improved player honors, going 1-5-6. Sophomore Scott Dornbrock scored in last week’s exhibition and went 2-6-8 in 2014-15. Senior Chris Joyaux ended last season with six assists in 38 games, and junior Colin Sullivan was limited to nine games because of an injury and the RedHawks’ team depth, but the former Montréal Canadiens draftee played well when he was in the lineup. 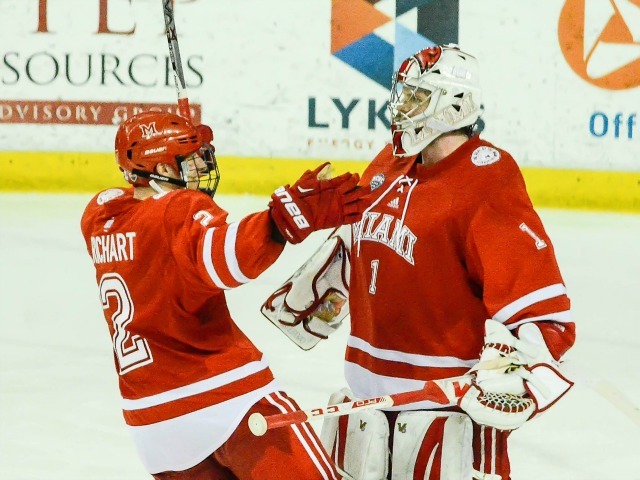 “Really, all year, (the defensemen) were unbelievable in front of me, blocking shots and limiting second and third opportunities, getting pucks out of dangerous areas,” senior goalie Jay Williams said. “We really started firing on all cylinders from a systems standpoint and executing last year, so that was a huge help. The only freshman on the team is Grant Hutton, who is 6-feet-3 and went plus-26 for NAHL champion Janesville in 2014-15. With only 24 players on the roster this year, Mooney has experience on defense and could jump in there if Miami has injury issues. “The luxury of having our veteran ‘D’ and goaltenders is nice, and we can focus on the younger guys up front,” Blasi said. The blueline corps, which found the net just 16 times all of last season, scored three of the team’s six goals in the exhibition. “It’s the effort to get more pucks on net, and we’re going be moving up in the play a lot more and helping our forwards out on the rush, so that’s how you get three goals, when you’re doing that stuff,” Caito said. Like the defense corps, Miami has an all-veteran starting corps here. 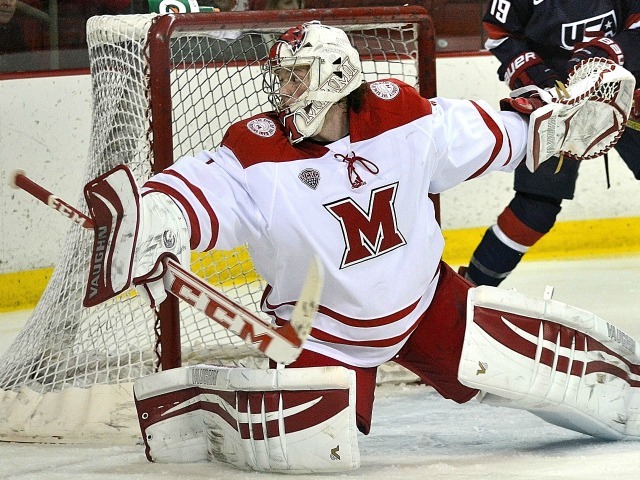 Williams had his best season as a RedHawk in 2014-15, going 19-8-0 with a 2.04 goals-against average and a .917 save percentage. His 38 career wins rank him fifth all-time in Miami history. Williams also tied a school record with five shutouts. McKay, also a senior, went 6-6-1, 3.09 and .898 last season. While his numbers weren’t great, he posted a .946 save percentage as a freshman and has the second-leading save percentage on the school’s all-time leaderboard (.920). He is also fourth in career shutouts with eight. Williams ended up logging the majority of minutes last season, but both should play a significant amount this year. “It’s awesome, the two-headed monster has always been key for us, and I know both guys are going to step up for us and have great years,” Caito said. Those two should eat up all of the minutes in net for the RedHawks, and freshman Evan McCarthy will serve as the team’s third goalie. 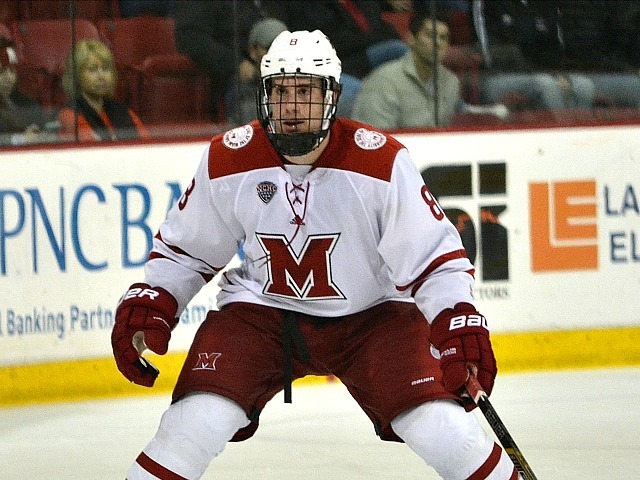 McCarthy, who is expected to compete for playing time next season, went 9-8-3.05 for NAHL Kenai Valley in 2014-15. With the success of the Miami hockey program the past decade, many skaters and goalies have muscled up the ranks in numerous categories. The Blog of Brotherhood takes a look at some team and individual numbers to watch 2015-16. 1. Miami’s win total – According to its media guides, Miami has 679 all-time wins and needs 21 to reach 700. The RedHawks have recorded at least that many victories in nine of their last 10 seasons. Coach Enrico Blasi has 351 of those wins, and he has coached the team for 16 of its 37 seasons. 2. Sean Kuraly’s GWGs – Kuraly set a school record in 2014-15 with nine game-winning goals. Sean Kuraly (photo by Cathy Lachmann). He is already in a six-way tie for fifth all-time at Miami with 11 for his career, and he needs just two to move into third on the career leaderboard. Ryan Jones owns to RedHawks’ mark with 21. 3. Jay Williams’ wins – With a breakout 19-win season, Williams is now tied for sixth in the school record book with 36 victories. He needs to just five to crack the top five and is 24 off the Miami mark, held by 2003 graduate David Burleigh (60). 4. Coach Enrico Blasi’s win total – This is now one to watch each year, as Blasi is already 30th in Division I history with 351 wins. Remember that Blasi took over the job at age 27 and won’t turn 44 until next February. With 10 of the school’s 12 NCAA Tournament appearances occurring on his watch, including its only two Frozen Four berths, and nine trips to the NCAAs in the last 10 years, Blasi should remain in Oxford for a long time. 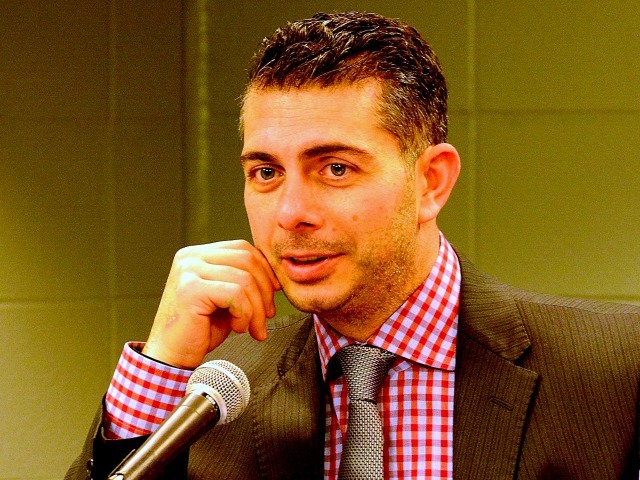 Enrico Blasi (photo by Cathy Lachmann). A number of coaches immediately ahead of Blasi are still active, so moving up the ranks the next couple of seasons will be difficult, but he has a legitimate shot at 400 by the end of 2016-17, which is a pretty big milestone in college hockey, especially since teams play just 35-40 games per campaign on average. By the way, Boston College’s Jerry York holds the NCAA record with 984 wins. 5. 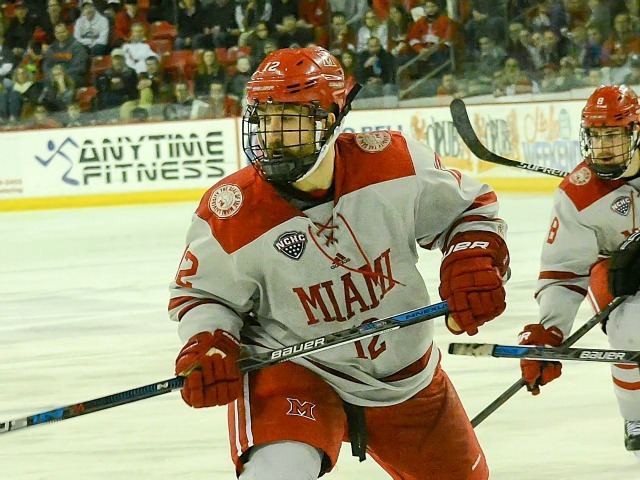 Anthony Louis points – Miami fans have been spoiled over the past five years with Andy Miele, Carter Camper and Austin Czarnik all posting over 150 career points and shooting into the top 10. This is more of a 20-16-17 tracker alert, as Louis will be a junior this fall, but he already has 21 goals and 40 assists for 61 points, and with 36 points last season, he could become the 51st member of the 100-point club. Barring injury and other factors, he could move pretty far up the 100-point club list next season. 6. Matthew Caito defenseman points and assists – The senior has slowly been moving up the ranks, and he is just four out of the top 10 in points by blueliners. He is averaging 20 points a season, and 20 more would give him a career total of 81, placing him eighth in school history for defensemen. His 49 assists have him one out of the top 10 behind Cameron Schilling. If he hits his average of 16 he would also end his career eighth that category among defensemen with 65. 7. McKay/Williams shutouts – Jay Williams tied a school record with five shutouts in 2014-15, giving him seven for his career, and he is still one behind Ryan McKay for the active lead. McKay has eight and Williams is at seven, ranking fourth and tied for fifth in school history, respectively. The record is held by Connor Knapp (13), and Cody Reichard and Burleigh are tied with 12, so both would have much work to do to move up, but they have had exemplary careers in Oxford and either could challenge the record, especially if one takes over the starting reins exclusively. Jay Williams (photo by Cathy Lachmann). 8. More Jay and McKay – Speaking of goalies, despite an off-year, McKay is second in the qualitative career save percentage category at .920. Williams moved into the top 10 and is sitting at .911, good enough for sixth all-time. Jeff Zatkoff is the RedHawks’ leader at .927. 9. Even more Jay and McKay – And then there’s goals-against average. Williams moved ahead of McKay and into fourth place in this qualitative stat at 2.29 vs. 2.31. Williams has the fourth-best mark in Miami history, McKay is fifth. Connor Knapp holds the school GAA mark at 1.94, and that would take a major effort to topple, even if one started almost every game and went well below 2.00 this season. 10. Caito’s games-played total – Among the seniors at Miami, Caito is the clear leader in games played in his three seasons with 119, having missed just one contest (the 2014-15 opener vs. Bowling Green…Miami lost that game…coincidence?). He needs to play 39 games this season to tie for ninth all-time, and his advancement in this category depends on his continued health and earning the right to dress (a near given to this point with him) as well as the team’s success. Only five Miamians have played 160 career games, but he has a shot to join that exclusive club.